A wholesaler has been hit with fines and court costs of more than £60,000 after consumer watchdogs discovered the company selling meat it falsely claimed was halal to Muslims. Birmingham Trading Standards swooped on JKY Food Solutions in Bissell Street, Highgate, in July 2012 as part of Operation Swordfish, a city-wide investigation. Posing as a customer, an officer purchased a 12kg box of chicken for £22 and was assured by staff that it was halal, Birmingham Crown Court heard. But the source of the meat was later traced to a supplier in Ireland which, at that time, did not sell halal meat, said Barry Berlin, prosecuting. He added: “When the defendant received the chicken from its supplier it was not boxed or labelled as halal, but when they sold it on it was marked as halal. JKY Food Solutions, which boasted a £7.3 million turnover last year, previously pleaded guilty to one charge of breaching general food regulations in relation to the supply of 274 boxes of chicken worth almost £6,000 sold between April and September 2012. However, Mr Berlin said it was the “tip of the iceberg”, with records showing the company was selling over 1,000 boxes of chicken a month from various suppliers. Gerard Cullen, defending, said that despite the firm’s multi-million pound turn-over it made a loss of nearly £50,000. “Both the director of the company and his 18 employees are all Muslims and are equally as offended to have non-Halal meat,” he said. “There is no dishonesty here, it is more an offence of complacency.”He said the company, which has since moved to Leopold Street, was now complying with the law. Fining the business £35,000 and ordering it to pay £26,910 prosecution costs, His Honour Judge Patrick Thomas QC, added: “The consumers who went there went for halal meat for powerful religious and cultural reasons. A business has been fined £35,000 after pleading guilty to one offence relating the sale of non-Halal meat to a Trading Standards officer. Birmingham City Council brought a case against JKY Food Solutions Limited, based at 96 Bissell Street in Highgate, Birmingham after a box of chicken (weighing 12.03kg) was sold as Halal to an officer. The company, prosecuted under General Food Regulations 2004, was also ordered to pay to £26,910 court costs and £120 victim surcharge. On 19 July 2012 two officers visited the company’s wholesale premises as part of Operation Swordfish, a city-wide investigation into traders supplying mislabelled Halal and non-Halal meat. An officer, posing as a customer stocking up on meat ahead of the month of Ramadan, was shown the freezer where chicken products were kept. He noted that many of the products carried a serial code (IE 803 EC) which he did not recognise, and therefore would need to check the supplier’s details. As the officer bought a box of chicken, he was assured it was Halal. The receipt for £22 also stated, in Arabic, that the meat was Halal. Trading standards officers, along with West Midlands Police, executed a warrant on the Highgate wholesaler on 12 August 2012, and as a result a large amount of documentation and a box of chicken were seized. 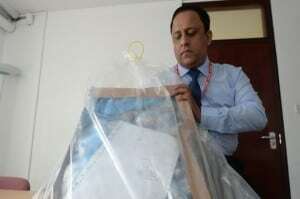 Documents seized from the company’s premises revealed that more than 270 boxes of non-Halal chicken were received for sale by JKY Food Solutions Limited between April 2012 and July 2012. Subsequent enquiries revealed the meat sold to the officer was supplied by a registered wholesaler in Co.Meath, Ireland, who confirmed that he had not traded in Halal chicken “for some months”. JKY Food Solutions Limited was allowed to continue trading from its premises in Highgate throughout this investigation, however it has moved to a new base at 126 Leopold Street, Highgate. Cllr Barbara Dring, who chairs the city’s Licensing and Public Protection Committee, said: “Food fraud is a major concern that we take very seriously and, as in this case, we will take appropriate action – including prosecution – where any case warrants this. “Consumers, particularly those who follow strict dietary guidelines in line with their religious beliefs, expect to food labelling to accurately reflect the provenance of their food.